Wish they had cheaper parking. Convenient to all activities on my he river walk. Fantastic hotel, clean, many amenities, excellent Staff. Very friendly and helpful staff. Great location. The double decker city tour bus has a stop in front of the hotel. What we liked was the interior design. What I did not like was that the patio allowed smoking. Hot water and near a lot of places. Good for the price and easy to drive to. Nice location and area with friendly staff. Only carpet cause my allergy active. .Great location & spacious rooms I was not a fan of the small fat little pillows but I know that's a bit nit picky. Loved the location to all the activities and Riverwalk. Didn’t care for scanning your room key every time to use the elevator. My shower headed needed replaced and a hook on the bathroom door would have been nice. Recommend pictures of San Antonio be put on the walls as mine were bare. The second largest city in Texas, San Antonio is both a fun and historic city to visit, attracting tens of millions of visitors each year. Home to the San Antonio Missions UNESCO World Heritage Site, a wide selection of entertainment and theme parks including Six Flags Fiesta Texas and countless museums as well as a vibrant nightlife district and enviable selection of restaurants and shops, there is no shortage of things to do in this top US American city. There is an excellent selection of hotels to choose from in Downtown San Antonio if you want to stay right in the city center. Staying in Downtown means being close to the beautiful San Antonio River Walk, the top rated attraction in the city. There are also lots of fun activities departing from here including bike tours, Ghost tours, and segway rides. History buffs or those seeking a little culture visiting San Antonio will have the San Antonio Missions at the top of their list. There are lots of hotels close to theAlamo Missions, which will allow you to tour the area at ease. Dating back to the 18th Century, The Alamo was founded as a Mission and Fortress compound by the Catholic Church. Today, it is a museum and part of the larger Missions UNESCO World Heritage Site. In case you are visiting San Antonio with kids, or you are a proud big kid yourself, then no doubt a visit to the thrilling Six Flags Fiesta will be on the cards. This sprawling 200 acre amusement park is one of the top attractions in Texas and the largest theme park in San Antonio. The park is especially fun at Halloween and Christmas when they decorate all the rides and have special shows. There are 89 3 star hotels in San Antonia that you can choose from. 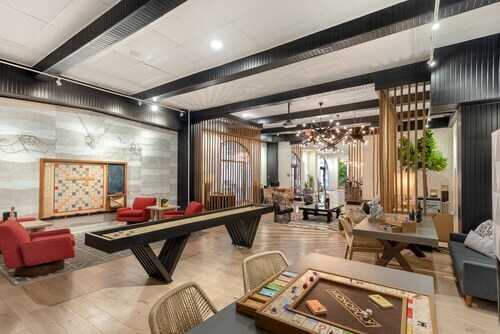 These 3 star hotels in San Antonio include a wide range of amenities, such as large rooms or suites, central locations, hearty breakfasts, WiFi, and parking facilities. Looking for a little luxury? San Antonio has 24 4 star hotels in the city to choose from. These beautiful properties come with excellent facilities including safe parking areas, amazing views overlooking the river, gyms, and swimming pools. If you are travelling to San Antonio for a meeting or conference, there are a staggering 279 business hotels in the city that will help you get work done in no time thanks to their conference facilities and small business centers. San Antonio International Airport is the closest airport to San Antonio, and serves both cities around the USA and cities across the world. If you have an early morning or late night flight, there is a wide selection of airport hotels, where you can get some rest before or after your flight. I liked how friendly and accommodating everyone was and how prompt and easy it was to check in and out. The door service at the front is a nice touch as well. We really enjoyed our stay.